The Princess’s dress was created by Peter Pilotto, the brand helmed by designers Christopher De Vos and Peter Pilotto. The London-based duo, who have dressed the Princess on previous occasions, are famous for their digital prints, but this was a much more minimal affair. The ivory satin jacquard dress had a fold over V neckline and long sleeves. Cinched in at the waist, it had a full skirt and long train. Eugenie chose to forgo a veil but, like many royal brides before her, borrowed a stunning tiara from the Queen. 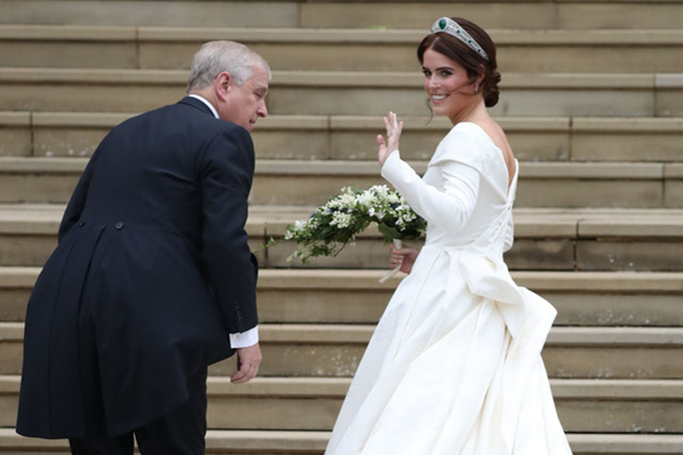 Royal watchers on Twitter loved the dress, saying Eugenie looked suitably princess-like with many deciding they preferred the dress to the Duchess of Sussex’s Givenchy gown. So it was a hit on social media, but what did bridal wear experts think? “Peter Pilotto and Christopher De Vos – well, that was a surprise, but it works so well and she is a big fan of British fashion,” says Hunt. “It’s fantastic to see Eugenie opting for a British designer who wasn’t even in the running as a favourite for her to pick,” says Sarah Allard, editor at Hitched.co.uk. “It’s incredibly refreshing to see Princess Eugenie showing her back operation scars on her big day, and a far cry from the picture-perfect bride we were presented with when Meghan married Harry,” says Allard. “I love the Greville emerald tiara,” says Hunt. “According to royal protocol, tiaras are reserved for brides and married women so this will be the Princess’s first chance to wear a full-on one! So lovely with matching earrings. “There is a trend for simple and less embellished dresses, plus off-the-shoulder and understated elegance and I am sure that she will influence some brides to be,” says Hunt.